Walking in the Dust starts by describing the restoration of Leonardo Da Vinci’s Last Supper as a metaphor for my goal of brushing away the dust of the ages to see Jesus in his world. And here it is afterward. Another painting I mentioned was “The Jesus of the People,” which won a contest in 2000 for being the image of Christ for the next millennium. 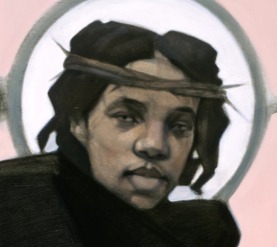 The artist’s goal was to portray Christ in universal terms, and you can see blackness and femininity. What’s missing, of course, is his Jewishness. Of course the Jesus I grew up with was hardly more authentic. 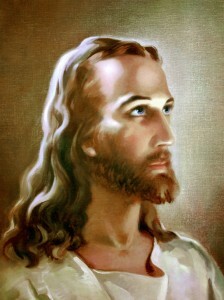 This was the blue-eyed Jesus painted by Warner Sallman in 1940. He’s the one who is still comfortably familiar to me. His picture hangs on the wall of my parents’ home even today. As I said in the chapter, every culture tends to portray Jesus in its own terms, in order to understand him and relate to him. As the Gospel has gone throughout the world, it’s only reasonable. The challenge is to set aside one’s own context and follow Jesus into his. The repainting of Jesus in the “Last Supper” is very much how I see the Christian Faith. It has almost become watered down and distorted. We have to get rid of the world view that we tend to cling to and get back to the heart of Jesus and Father God. What you say in this blog is very interesting. In my Discipleship class we just talked about what Jesus really may have looked like. In our culture, we see him as a man with blue eyes, and beard and long flowing hair, similar to your picture at the bottom of your post. When I think of Jesus, I really still think of Him like this. I know that it doesn’t look like a Jewish man, but that’s just what I think of. da Vanci really might have set this image of Jesus in our brains. This is what I grew up thinking of what Jesus looked like. It’s very interesting to think that he probably looked a lot different than this. It is amazing how each culture changes Jesus so that we can relate to him. When we lose the context of Jesus, we lose the context of the Bible. Does this changing of his features help or hurt the Kingdom of Heaven? It makes it easier for people to relate and accept him, but it also changes the way we hear what he says. It is pretty weird to think about how all the pictures in my house of Jesus are wrong. Makes me wonder if there are any other facts I have wrong about Jesus. Yet, this is all unimportant when it comes to trying to be like Jesus rather than look like him. The last painting of Jesus on this blog is very much how I see Jesus. It wasn’t until RVL’s class that I learned these paintings are really off. The painting I see of Jesus isn’t a Jewish man, and Jesus was. It is crazy to actually try to picture what Jesus looked like in his age. I now have a different picture in my mind because of what we learned in RVL’s class. In this post, you talk about Da Vinci, because your book starts by talking about him as well. You say that Da Vinci’s work of the Last Supper is very wrong. Another painting you talk about is “The Jesus Of The People,” in which he doesn’t look Jewish at all. You talk about how different cultures view Jesus differently in order to understand him better, I like all of these ideas. It’s interesting to see and dig deep into what Jesus actually may of looked like. It’s cool to see everyones different thoughts and opinions on this subject as well. In our discipleship class, taught by RVL, we dug into the text and talked a little about how Jesus may of looked, and it may not be the way we see the paintings today or how people see him today. Its always interesting to me to see different cultures represent Christ’s image in different ways that are influenced by their culture and environment. 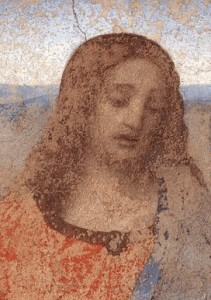 I was fascinated to see da Vinci’s restored depiction of Christ and how it goes against every cultural indication. To see how everyone thinks that Jesus looks just a little different is very understandable. The sad thing is that many people want to take him out of the culture he grew up in. Also I think sometimes we stress to much what Jesus looks like and should focus more on sharing the gospel. It’s really interesting to see how the views of Jesus change from one culture to another. Rarely do you ever see Jesus portrayed in his Jewish context which is weird because that is the context which he lived in. I don’t think it’s that important to know exactly what he looked like but we should still view him in the Jewish context that he lived in. Like most of these responses, I agree. I grew up with Jesus portrayed in my mind the same picture your parents have. However, now having the knowledge that Jesus was of Jewish decent, I would like to picture him differently. Either way, it’s cool how everyone has a different picture in their head of “their” Jesus. I don’t think it’s too much of a big deal of what we think he looked like rather than believe what he actually did. I have a picture of Jesus praying in the Garden and have one where His skin is darker, eyes ever dark and a beard with a prayer shawl over his head. After reading the article I studied both closely and like the dark skined one best. I guess since a child and being told Jesus was Jewish in my heart that is how I see Him, good article and post also. What Jesus looked like as He walked on earth really isn’t that important in my view. It is learning His ways and will so we can mirror His inner character is far more important. Jesus came through the Jews and did all that the Law required to fulfill the Law and the Prophets. He is far more than a Jewish man now in the Heavenly realm. John fell down on his face like a dead man when he saw Jesus in the spiritual realm. I believe that Jesus can reveal himself as any race since He is God and will be God forever.